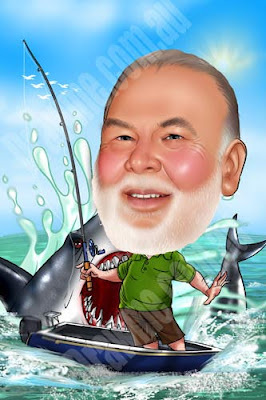 Everyone seems to love fishing and what better way to celebrate your chosen sport than with a fishing caricature. Over the past few years I have painted many fishing caricatures which have been quite funny in their design. The most popular one at the moment is the fisherman with the shark about to eat him as you can see here. This guy is so proud posing for the camera that he has yet to notice the shark about to take out his boat! I thought it was about time I came up with some new designs and so work has started on the latest fishing caricature drafts. The idea is to have a fisherman happily fishing away. Meanwhile, a rather large bird is perched right on his boat eating the fish he has just caught. Initial sketches were drawn to get the layout of the caricature correct. Leaving space for the large head is always a consideration. After the rough sketches were completed it was then on to the final line art for this piece. Clean lines, correct positioning of objects, and a balance between humour and telling a story are all evident in this caricature. 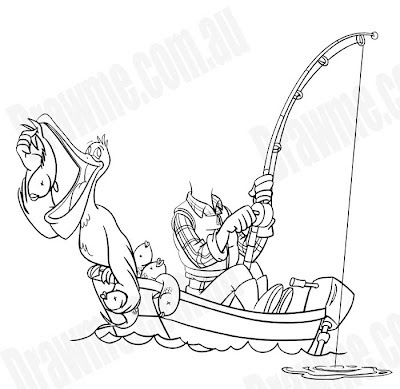 Over the next few days (depends how many orders are placed) I'll be doing the colouring for this fishing caricature. Then it's a case of seeing who would love to have their hand drawn head added to this design. There are many other designs available and new designs can always be commissioned and drawn to your exact requirements. All you need when ordering is a photo of the person to be drawn. A good expressive shot is always best. The photo should be clear, well focussed, and not be too small. If you are unsure then just send in the photo and will soon let you know if it is suitable. So, get in early on this design before it's too late! Order your very own fishing caricature today.